Calendars are printed through Shutterfly using dabstudios images and will be shipped directly to the recipients you specify. The Shutterfly Pro Galleries does not currently support calendar creation by customers, so we do the creation for you based on information you send us in a calendar order by email. Wall calendars come in 12-month or 18-month lengths, are spiral bound and 11"x17" in size when opened. You choose one dabstudios image per month plus one image for the cover, and specify any optional image enhancements for each image. You can see two examples of wall calendars in the Examples tab. Select one image for each month in the calendar and one for the cover by browsing the images in the dabstudios galleries. Make a list in the calendar order email of the months with the associated image file names from the dabstudios galleries. Note the image file name that you want used for the cover. border type (simple, rough, stylized, hard oval, soft oval, painted, rounded rectangle, photo corners, filmstrip, shears, stamp, polaroid, tape, angled frame) Simple borders have an edge type (none, white, black, black line, shadow box, blur), and a border width in inches (.1, .2, .4, .5, .6, .8, 1.2, 1.5). Angled frame borders have a colored (red, orange, yellow, green, blue, purple) outer frame. Complete the calendar order email message with the following information. Your contact information, name, address, and phone number. The shipping information for each recipient, name, address, phone number and the number of calendars to ship to each recipient. Prices listed do not include shipping and taxes. Prices listed are per Wall Calendar. 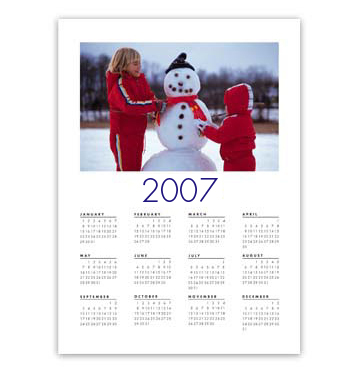 2007 Year-At-A-Glance calendars are printed on single sheets of Fuji Crystal Archive photographic paper and come in 11"x14", 16"x20" and 20"x30" sizes. You choose one dabstudios image and choose a calendar design. Please choose a year-at-a-glance calendar design. Examples of all the year-at-a-glance calendar designs can be viewed by going through the year-at-a-glance calendar creation process at Shutterfly with your own image. You can see an example of the 2007 in white year-at-a-glance calendar design in the Examples tab. Select one image for the year-at-a-glance calendar by browsing the images in the dabstudios galleries. Note the image file name that you want used for the year-at-a-glance calendar. Complete the year-at-a-glance calendar order email message with the following information. Prices listed do not include shipping and taxes. Prices listed are per Year-At-A-Glance Calendar.